Balega, a leading performance sock brand in the run and outdoor specialty market, announces the relaunch of its premium Footzen sock collection, debuting with a brand new look in the comfort footwear market nationwide next month. Known for technical excellence, superior fit and unbelievable comfort, Balega, now under the Implus LLC roster of brands, provides innovative solutions for anyone wanting to live an active, healthy lifestyle. Balega’s premium Footzen collection was created specifically for the comfort footwear market, and caters to those seeking a non-binding and non-elasticized sock, allowing for easy-on and maximum blood circulation. 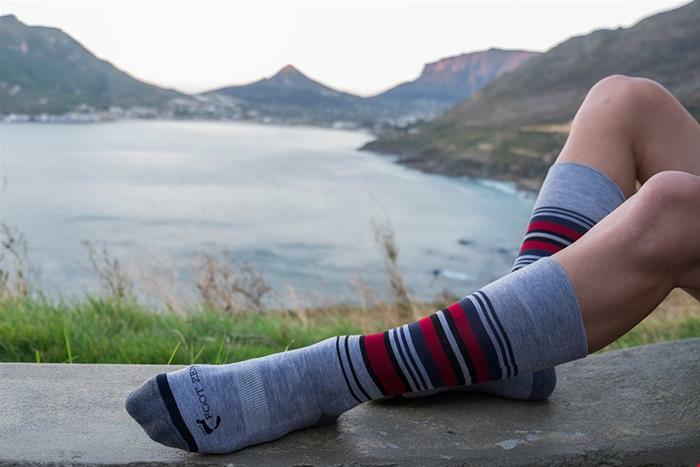 Produced in South Africa, Balega’s Footzen socks will debut with updated packaging, while retaining its core comfort walkers and crew-length socks. Footzen products are designed to protect the feet from abrasions and irritations without creating extra bulk in the shoe. A hand-linked toe closure creates a seamless fit to eliminate the risk of blistering while its MedDry® moisture system helps to maintain a healthy foot environment. The extra-deep heel cup in all styles ensures a consistent and perfect fit for all day comfort. Knit with a high needle count, Footzen offers the finest quality in comfort footwear offering. To celebrate its return to the comfort market, Implus will donate over 9,000 pairs of its Footzen socks to Soles4Souls, which creates sustainable jobs and provides relief through the distribution of shoes and clothing around the world. Since 2006, Soles4Souls has collected and distributed 30 million pairs of new and gently used shoes to individuals in 127 countries and all 50 states in the United States. In 2016 alone, the organization estimates Soles4Souls generated more than $20 million in economic impact worldwide. The mission of Soles4Souls is an ideal match for Balega, which prides itself as a company with “sole” – creating steps for better communities and enriching the lives of those less fortunate. To learn more about Balega and its ‘sole,’ visit: https://balega.com/our-sole. Footzen will be available May 15 in premium footwear retailers nationwide. A leading performance sock brand in the run specialty market, Balega is a designer and manufacturer of technical performance socks and part of the Implus family of brands. With a proud American-South African initiative, the company develops its product in both South Africa and North Carolina production facilities utilizing the best performance yarns produced in the United States. Crafted for a superior fit and unmatched comfort, Balega is committed to the technical excellence, quality, and performance expected in the Balega brand. A brand with ‘sole,’ Balega prides itself on its commitment to the community with projects aimed at enriching those less fortunate than ourselves. For more information, visit www.balega.com.